After purchasing a film scanner a while back, I decided it was time to dig into my old slides and black-and-white negatives and bring back the "Good Ol' Days" I spent in California back in the early 1970's while in the Navy. This will most likely be a work in progress, so keep popping in for a look. This shot holds a certain sentimental value, as this was the aircraft in which I learned how to do aerobatics. To give pilots additional flight time -- and to keep us non-pilots happy -- NARU (Naval Air Reserve Unit) Pt Mugu, our parent reserve organization, instituted the "morale flight" program. We were taken up and flown around the area and up and down the coast at wave-top level and pretty much anything else we wanted to do, all in this little red-white-and-blue beauty. One day Chief Fitzgerald, our Maintenance Control Chief, looked at me with a wry smile and said, "Duncan, you look like you could use a little morale." Before he could say, "Grab a flight suit and . . . ," I was dressed and out the door. As we were heading up the coast after takeoff, the pilot asked me if I had ever flown before, and I told him that I had been flying for years. He then asked me if I'd ever done any aerobatics, to which I replied, "No, I'm afraid not." Smiling into the rear-view mirror, he promptly walked me through two of the basics -- the loop and the barrel roll -- and then turned the stick over to me. My first barrel roll was a complete disaster, as I was sure there had to be rudder movement involved, which ended up with us in a heaving, twisting tumble through the air, my helmet (with head inside) bouncing off the plexiglass canopy. "That didn't come out quite right, did it?" he calmly asked, once I got us righted again. After a refresher on keeping the rudder inline, the next ones were picture perfect. The rest of the flight had us looping and rolling high above the hills of Malibu, before finally dropping down to buzz bikini-clad Malibu Beach on our way home. Talk about a boost to morale! That's one flight I'll never forget. Those are my squadron's (VP-65) Lockheed SP2H Neptunes in the background. 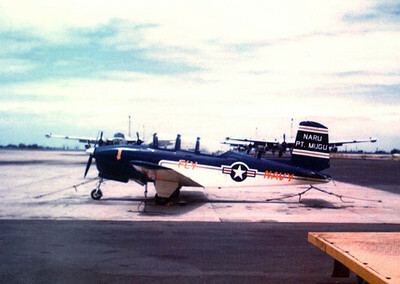 Neet seeing a pic of my old buddy, I was the AM at NARU/Nartu and I painted the nose number on these birds, and maintained them. I did 5 years there.